Has good feel for all pitches in any count with downward action. FB: 85mph. Lives on the bottom part of the zone. Stays in line very well with a repetitive motion. Has a slim athletic build. Soft but firm with his receiving. Blocks very well all pitches and very soft back to the plate. Quick twitch player with good first step reads/ angles and solid hands. Shows good carry across the field. At he plate he possesses natural lift without effort that has strength in swing from a LC approach from behind the ball. On field leader. Plus pop from the left side of the plate that uses all fields. Quiet, simple, patient approach that recognizes pitches early and stays in his plan. Advanced hitter. Flat, quick, direct path at the plate that uses all fields from behind be ball in a gap approach that shows strength to all fields. 79-82,83. Flashes arm side run. Works both sides of the plate. Breaking ball with 2/8 shape for strikes. Under control actions on the mound with good tempo. Competitor on the mound that does not get rattled. Strong, tall, athletic build. Gap-to-gap power. Aggressive at the plate, handles the inner half of the plate well. Good speed and instincts on the bases. Gets good reads and jumps in the outfield and covers a lot of ground. 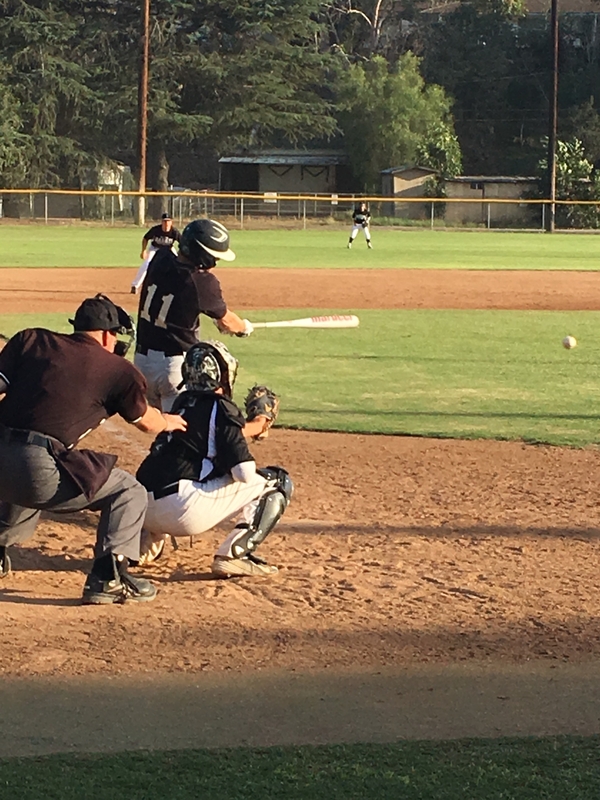 Lean athletic build – Complete Game shutout, scattered 4 hits, mixed pitches very well commanding FB, slider and change to both sides of plate. 69 total pitches with 51 of them for strikes. Athletic build, aggressive approach, flashes pull side hard contact. Moves well around bases with good instincts. Tall a slender frame with loose and easy delivery. Showed fastball command at 84-85mph. Pop time of 1.94, with quick actions and a loose arm. 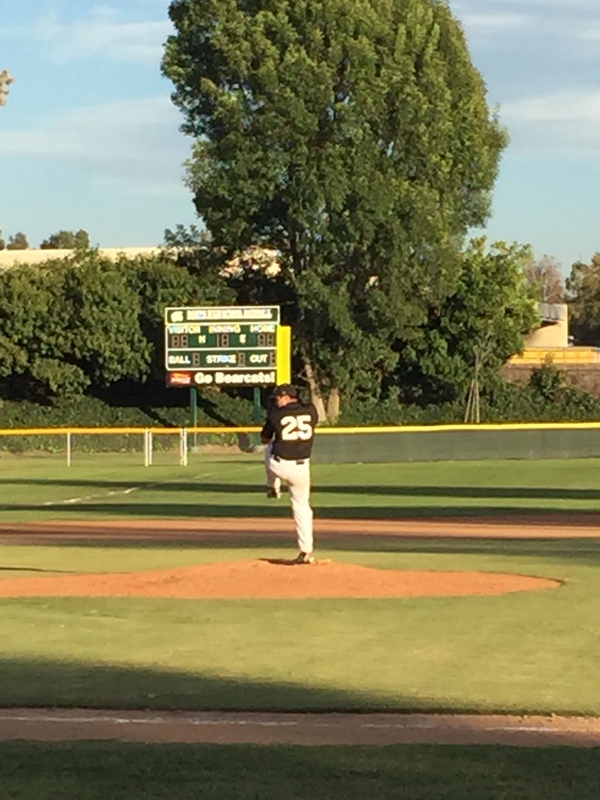 Off the mound he has downward action, 85-87 with the FB topping at 88 & 76-81 with a sharp slider with 10-4 action. Big competitor. SDSU Commit. Smooth delivery with some fastball command at 83-86mph with some late movement to the arm side. Flash a changed up with good arm speed that kept hitters off balanced at 72–73 mph. Lean athletic frame, plus range in the OF with good angles. At the plate works to stay inside with a flat path and good extension. Flashes leverage to both gaps. Nice frame with upside. 6’4 slender frame with rm to grow. Loose and easy arm speed. FB 84-86 with slight run along with a power curve. Solid frame. Flashed next level bat speed along with some opposite field pop from the right side. Fastball 79-82 with downhill plane to both sides of plate. Breaking ball: 12/6 shape and flashes 11/5 shape as well. Change-up: 67-71 with sink. Ability to mix all pitches with feel for the count at same arm speed. Loose arm actions with easy tempo. Balanced, patient approach with loose hands to extension from a direct, compact swing. Middle to opposite field path that is on plane. Quiet rhythm. Rangy quick twitch actions from a good first step read. Good angles to baseball that reads hops. Plays low and athletic as he shows multiple arm angles with good strength. Patient approach at the plate with feel from a compact/ direct path that looks to use all fields. Stays balanced in base and hits from behind the ball. Lean and tall frame with room to fill out. Chris Sale type build/arm angle. FB: 78-82 with arm side run and sink SL: 68-71 with 2-8 break. 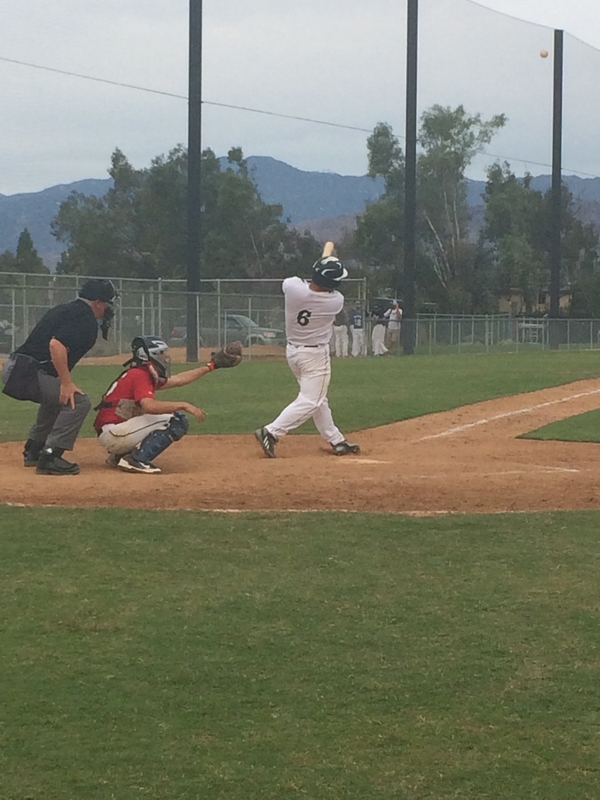 Holding Canyon HS hitters to 1 hit and 0 runs through 4 innings of the championship game. Striking out the side in the 4th. Lean athletic frame with sound actions at SS, moves well laterally with soft hands and plus arm strength. Offensively smooth on time rhythm with ability to stay inside the baseball and good feel for barrel. Lean athletic frame – Good balance and feel for barrel, aggressive path with hard contact to pull side. Flashes good extension with a pair of extra base hits. Slim athletic build, good arm side run with FB 83-85mph. Breaking ball is sharp with downward action at 66-68. Strong athletic build, very good blocking pitches in the dirt. A little stiff receiving, but solid overall defensively. Throws well to all bases with an average pop time. Strong, flat swing with good extension and lower half action that works in a middle approach. Ball jumps off of bat with back spin. Consistent 3b with soft hands and good reads. Good carry across. Flat, whole-field approach swing that has some feel for the barrel and can spray the ball from a line drive path. Sure receiver behind the plate that sticks and beats ball to spot. Soft to block and shows some range laterally. Strong athletic build with a plus arm in the OF. Moves well and covers ground. Tall slender frame with fluid mechanics. Loose and easy arm action with FB at 84-86 with some downhill action along with some late movement has a feel for his secondary pitches lots of room for growth at the next level. Long lean frame with room to fill. Committed to BYU easy arm swing with a compact delivery. FB has natural arm side run. Cb 72-74 with 1/7 action and can throw for strike and put away pitch. Loose arm that will continue to get stronger. Slender frame with room to grow. FB 82-86 with slight downward moment command is still developing flashed slider and change up with the slider 11-4 action at 72-74 and change with some depth at 74. Good upside for Hawkshaw at the next level. Fastball at 88-90 early in putting with slight run. Worked both sides of the plate. 70-72 breaking ball with 11/5 shape at medium to late break. Change up at 75-78 with good, deceptive arm speed. At the plate: flat oath that stays inside the ball that can use all fields in a line drive approach. Stays simple in swing with good feel for the barrel. Lots of room for growth, fluid motion, late downward action with the FB at 84mph. Sharp and late break with his slider (11-5). Battles, competes and shows no emotion up or down. Loose quick actions with soft hands. Good range with quality angles and routes to ball. Shows multiple arm angles and reads hops/ makes adjustments. Simple approach with compact, quick, direct path. Tall, athletic build. Smooth delivery from the mound. Fastball sat at 82-84, topping at 85. 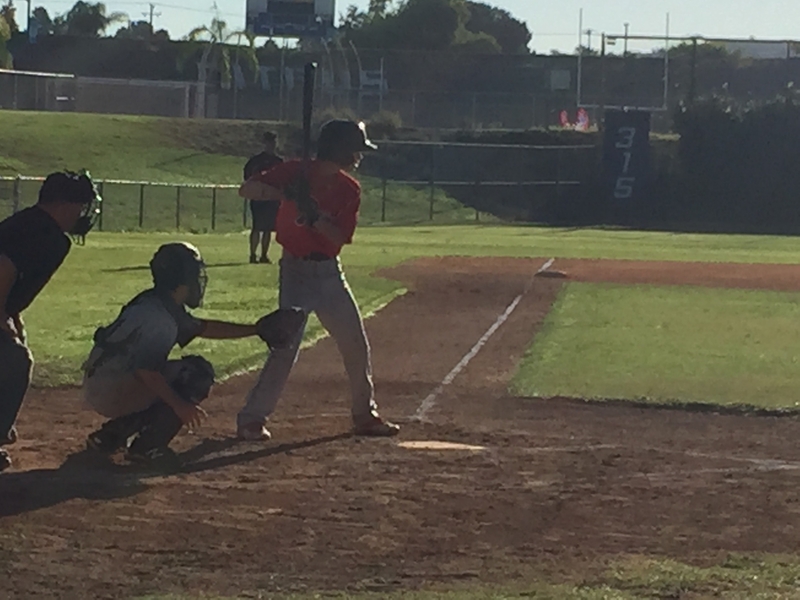 Commanded both sides of the plate with fastball. Mixed in curveball that sat between 67-69. Lean wiry frame sure handed SS with good lateral footwork. Offensively short compact stroke works to spray the ball on a line. 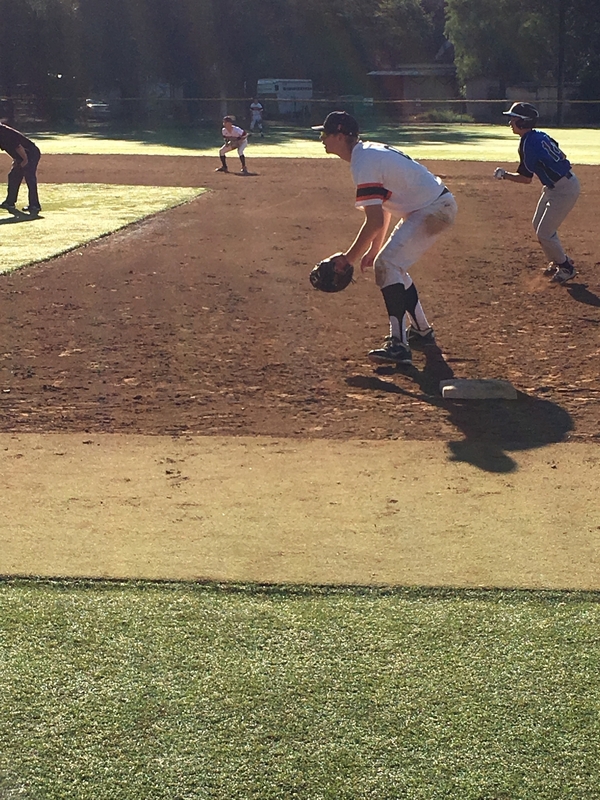 Big strong frame committed to UC Santa Barbara – good extension to pull side gap. Big target at 1B with plus actions around the bases. 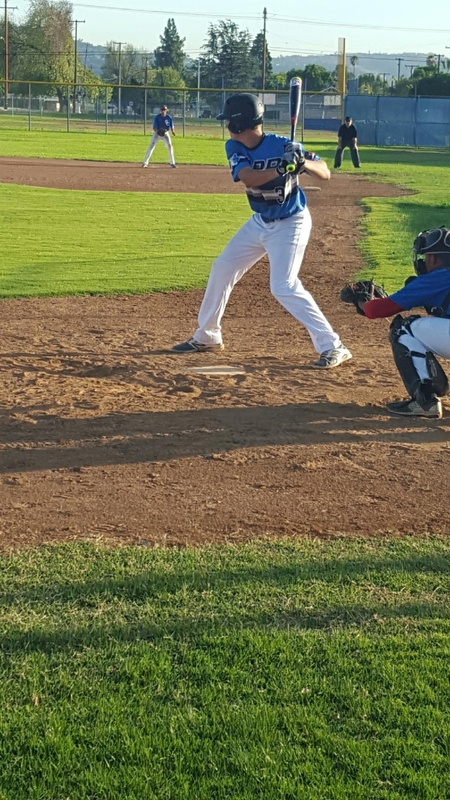 Lean athletic frame, plays a sound OF with good closing speed and angles made a diving catch early in game. Short compact swing with good balance. Ability to spray ball on a line to all fields. Smith left handed oath that is direct from a middle of field approach as a line drive hitter with loose hands. Stays in base and uses lower half well and head stays quiet. Fast bat speed with whippy, hands/ bat path and good extension. Strong swing with middle approach and a good lower half trigger that. Reads hops well with solid hands and picks through hops. Above average carry across. Smooth delivery. Straight over the top with a fastball at 82-84 with good late movement. Flashed good command of FB. 6’1 190 solid frame. Fastball 82-86mph likes to work downhill command looks to be still developing flashed a sharp 1-7 curve with some feel. Strong athletic frame, SDSU commit. Strong wrist and soft hands, blocks well and moves laterally quickly. Strong arm to go with quick feet showing a 1.79 in game pop time. Strong framed corner INF, who was DH’ing. 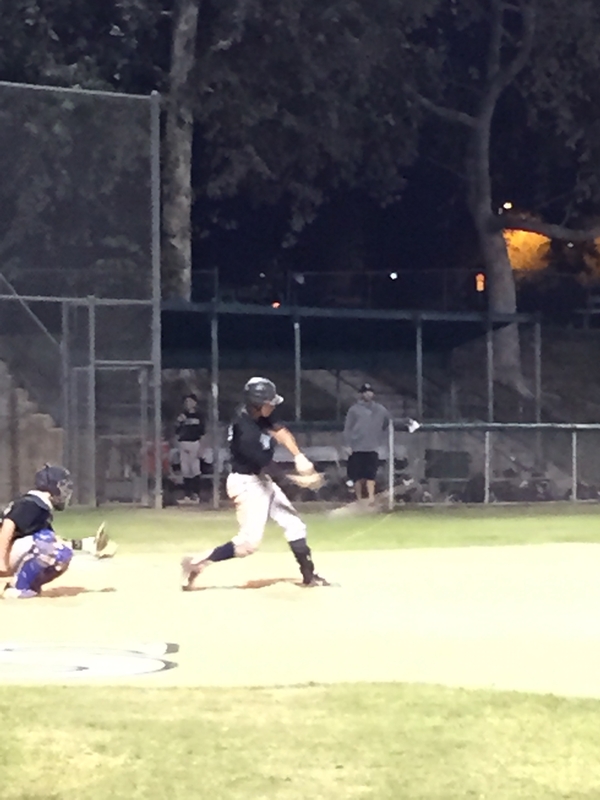 At the plate short compact swing as works to hit the ball on a line with good balance. Flashes some leverage to pull side. 6’4 Physical frame, showed in game blocking abilities, smooth receiving skills, quick transfer & arm strength. 2.09, 2.08, & 2.10(from knees) in between innings. Jake has a strong solid build with above average speed. Doubles to the opposite field gap well. Runs very well around the bases and covers ground in the OF. FB Velocity: 87-89 with late arm side run BB: 75-76 with sharp 12-6 break. Has great feel for both pitches and keeps same arm speed with both. Definitely a plus arm. 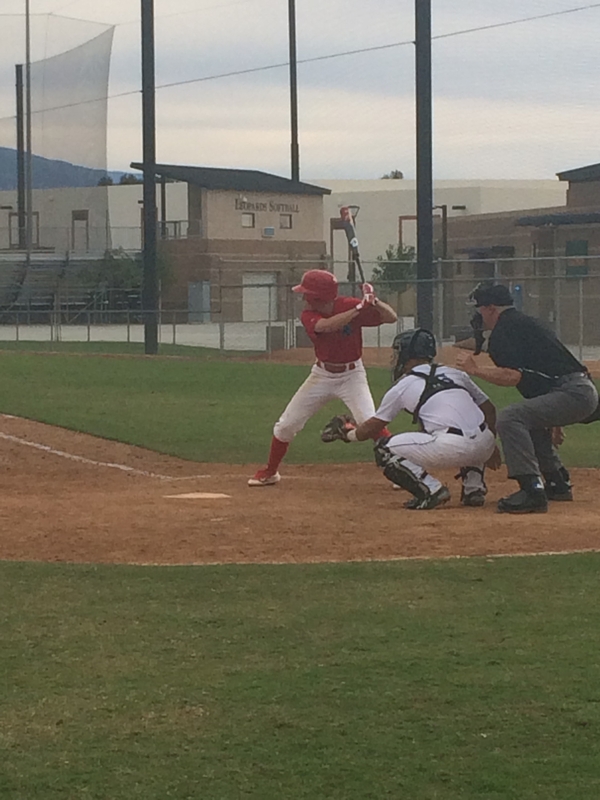 Pomona Pitzer commit, Compact delivery with good direction and balance. 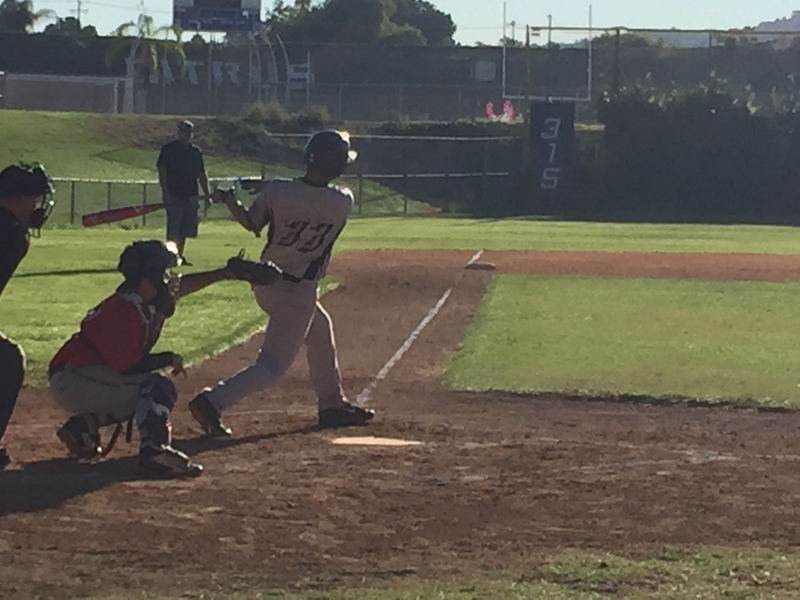 Works to both sides of plate with some run on his FB that sat 82-85. Strong broad frame with lots of room to grow as a freshman. FB is 80-82 range topping out at 84. BB at 76 with 11-5 action. Even keeled with his emotions on the mound and continues to compete with bad defensive play behind him. Keep an eye on this guy as he develops. 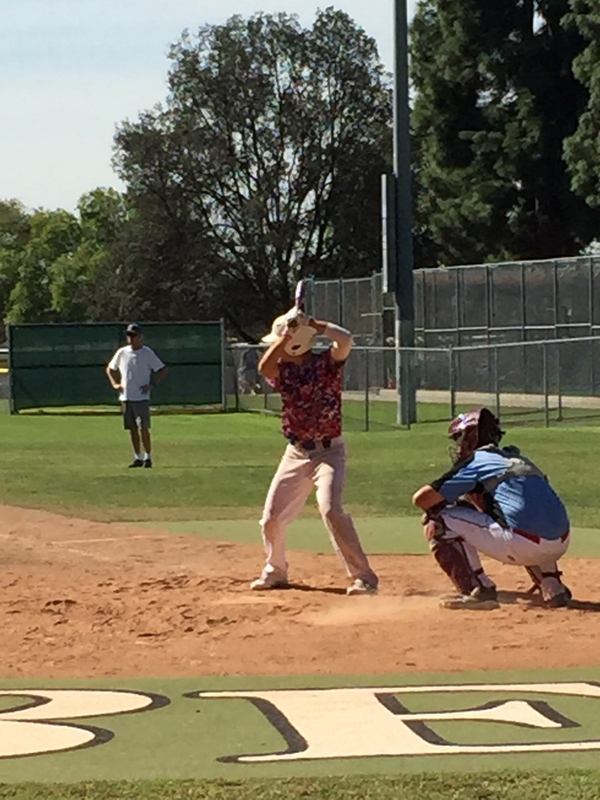 Complete game 1 hit shutout, mixed pitches very well working both sides of plate. FB sat 82-84 and using his off speed efficiently. Hides ball well from a compact delivery. Athletic frame with good closing speed and angles in the OF and quick release with some carry. Good feel for barrel and stays inside well with good balance. Hands are quick through zone on a flat plane with gap to gap leverage. Flat path from an easy leg kick rhythm that can use all fields from hitting behind the baseball. 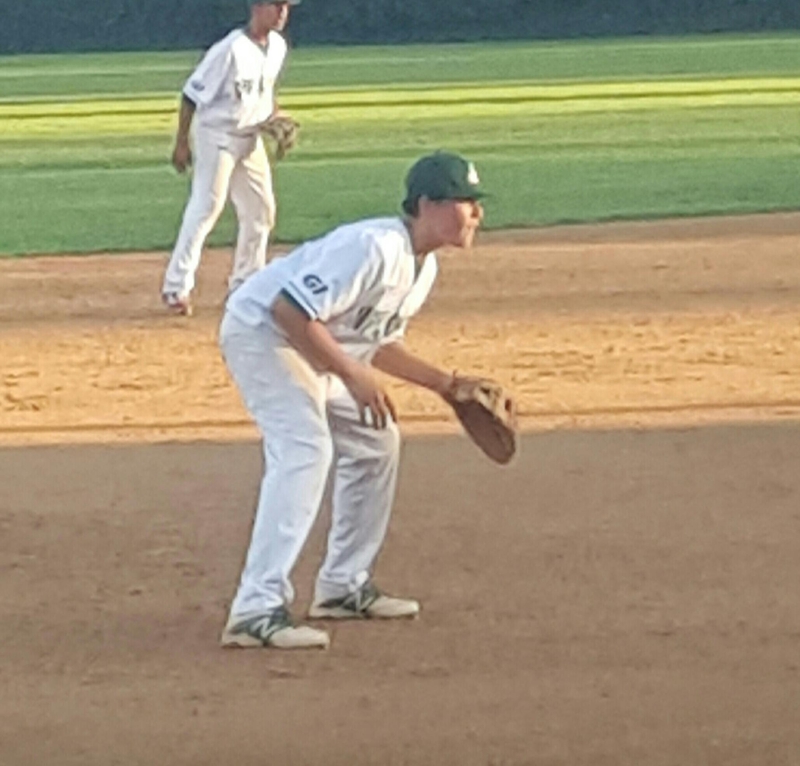 Good reads in the outfield with good angles, closing speed and arm strength. Plays smooth and light on his feet with loose actions. Good range laterally and holds good carry across the field and from the hole. At the plate, he is quick to contact with some loft. Aggressive to middle part of the field from a gap approach. Slim athletic build, moves very well in Center. Has a nice flat bat path creating some backspin. Middle opposite field approach, can drive the ball to opposite field gap. This entry was posted in 2018 Ryan Lemmon Invitational, Other Events 2018 and tagged A.J. Esperanza, Andrew Ryan, Anthony Corrales, Austin Hallman, Blake Burzell, Blake Faddoul, Blake Fitzgerald, Bronson Yager, Caleb Bennett, Christian Yogi, CJ Zwahlen, Cole Seward, Cory Lewis, Curtis Nagel, Cutter Clawson, Dallas Haggerty, Daniel Mendez, Danny Tiotuico, Dante Jackson, Davis Cop, Dylan Tanner, Eric Silva, Eric Walker, Ethan Rivera, Grant Vurpillat, Hagen Foreman, Jack Drury, Jack Haley, Jack Loechner, Jackson Lyon, Jacob Riddle, Jake Rome, Jake Skipworth, Joe Naranjo, John Pappas, Joshua Miranda, JT Kwary, Julian Aguilar, Kelly Hawkshaw, Kyle Crane, Kyle Velazquez, Logan Gallina, Lucas Gonzalez, Marc Filia, Matt Alexander, Matt Comnos, Matthew Elizadale, Nathan Manning, Nick Hansen, Niko Santamaria, Randy Collado, Ricky Lane, Robbie Weisskittle, Rocco Peppi, Ryan Daugherty, Ryan Kysar, Sam Stulman, Scott Gackstetter, Shawn Hepler, Steven Diaz, Thomas Buckanavage, Troy Melton, Will Rudy, Zach Waters, Zachary Locke on January 29, 2018 by Andy Ferguson.